…and Gail Carriger’s Soulless is coming out, so I’d better pick up a corset lest my sides will split! I had the pleasure of meeting the lovely Gail Carriger (who made such a great first impression, she will be my first ever guest blogger here…) on my journey back from Aotearoa. She is of a sharp wit, extremely geek chic (whoofah! ), and very straight-up in how she approaches you. Gail is also the next big thing in comedy Science Fiction. As Douglas Adams turned the genre on its ear with The Hitchhiker’s Guide to the Galaxy, Gail will be doing the same thing with steampunk in Soulless. This is the inaugural adventure of Alexia Tarabotti, an independently-minded Victorian lady-of-manners born without a soul and a penchant for trouble. Part Buffy the Vampire Slayer and part The Importance of Being Earnest, Soulless promises to be a ripping good yarn! Gail and the creative people at Artistic Whispers have put together this preview. While it does not look like it will be podcast, this sample is being made available to one and all. Thanks, Gail! 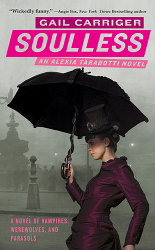 And if you are at World Fantasy in October, join us for “High Tea with Alexia Tarabotti” which will serve as the official launch of Soulless.